I have only been to New York once, and it was for two days over Christmas. In other words, I have never seen the Macy's Thanksgiving Day Parade in person. But it is my personal Thanksgiving morning tradition to watch the parade on television, in the comfort of my pajamas. When I was young, I sat transfixed. As an adult, I watch from the kitchen, as I catch up on whatever dishes I have left to prepare for the Thanksgiving meal. 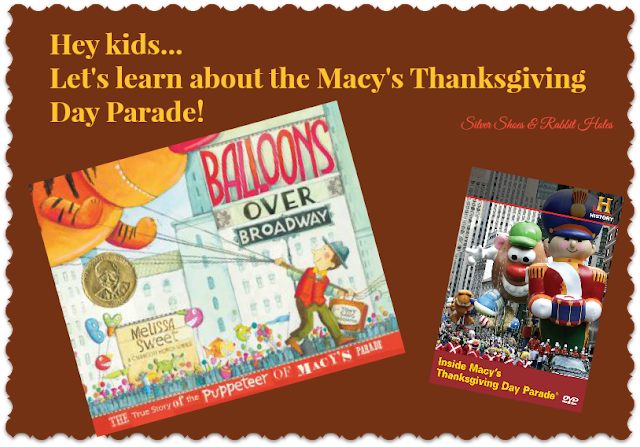 Last year, we read the wonderful Milly and the Macy's Parade by Shana Corey and Brett Helquist, which explained the origins of the parade through the fictional story of Milly, the daughter of an immigrant Macy's employee. 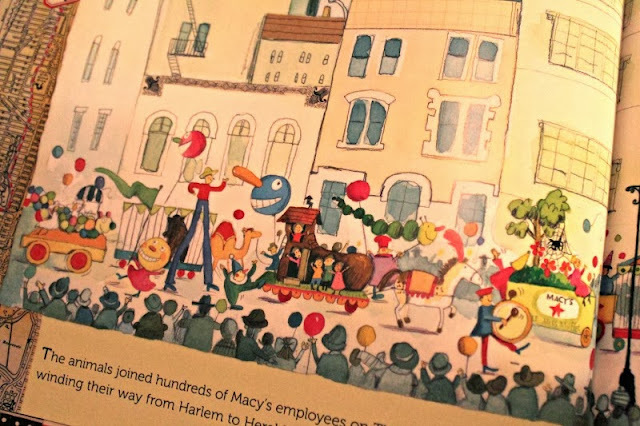 The first parade was held in 1924, and gave the immigrant workers of Macy's a chance to celebrate this very American holiday in Old World, street-carnival tradition. 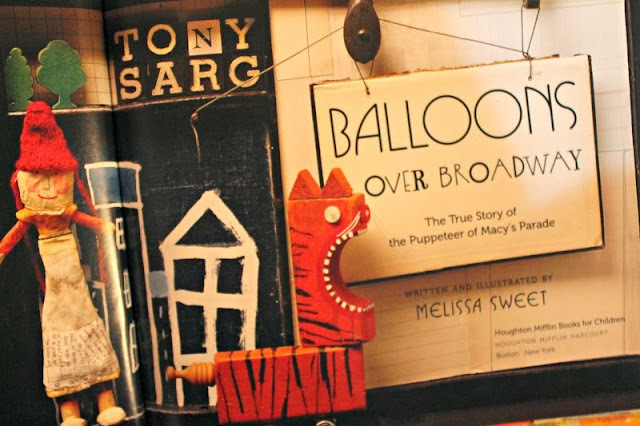 This year, we checked out Balloons Over Broadway: The True Story of the Puppeteer of Macy's Parade [Houghton Mifflin Harcourt, 2011] by amazing collage artist Melissa Sweet. Balloons Over Broadway is the story of Tony Sarg, puppeteer extraordinaire. Sarg was hired by Macy's Department Store to create an amazing window display for Christmas. The success of the display led to Macy's hiring Sarg to design the floats and attractions for the very first Thanksgiving Day Parade. The parade was a success, but the zoo animals, on loan for the parade, frightened the smaller children. Macy's asked Sarg to come up with a new plan. His idea? 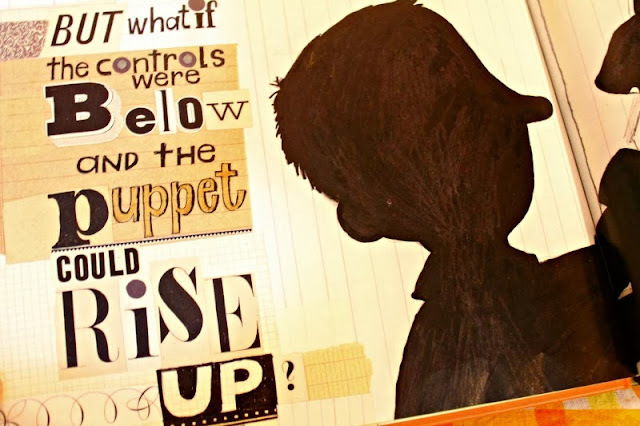 To team up with the Goodyear rubber company to design and build massive balloon puppets. The first year, the balloons were controlled by handlers using large sticks. Alas, this was tiring for the handlers, and the balloons could not rise high enough to be seen by the growing crowds. The rubber became rubberized silk, helium was added, and the controls became strings, carried by the handlers below, much as they are today. In addition to this book, we also checked out the History Channel DVD Inside the Macy's Thanksgiving Day Parade from 2009. 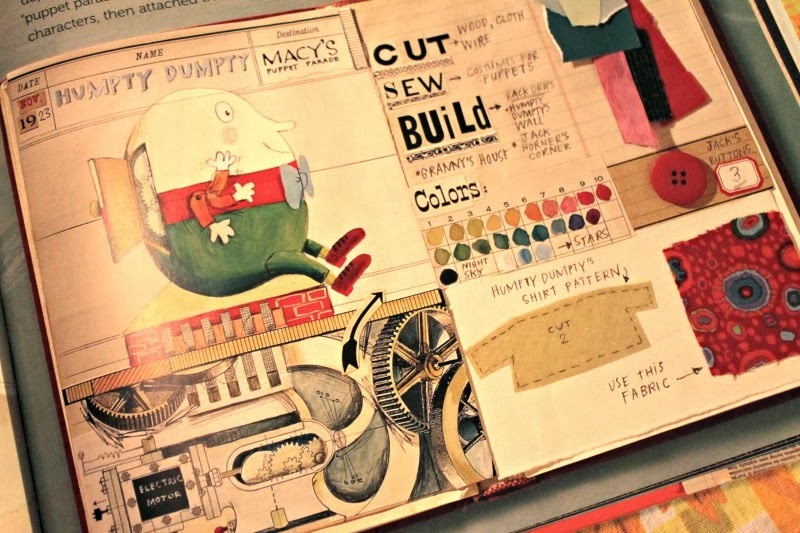 It covered similar material to both picture books, then continued into the modern era. 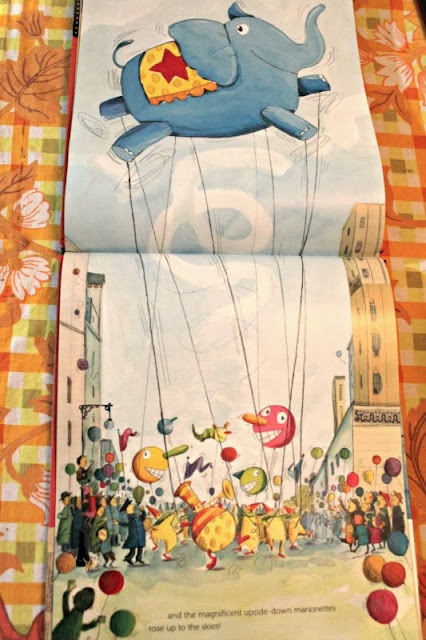 Did you know that in the late '20s through the early '30s, the balloons were let go at the end of the route? The first year, they forgot that the helium would expand, and the balloons exploded! After that, they began releasing some of the pressure from the balloons before setting them free. There was a contest. You could win a $100 gift certificate to Macy's for returning a balloon, which of course, was a lot of money during the depression. The releasing of the balloons was discontinued after 1933, when a pilot nearly crashed. Oops. 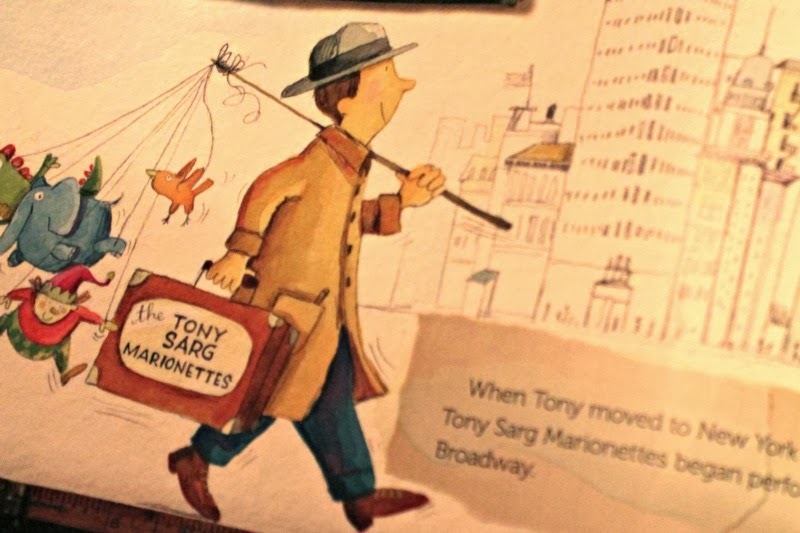 Of course, being a theatre geek, my other favorite reason to watch the parade on television is to catch the Broadway performances. Here's a fun one from 2010. It's a great picture book. 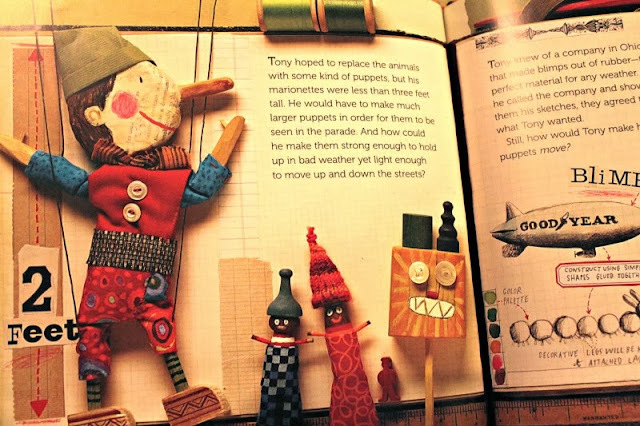 She created the puppets in the book herself, as part of the illustration process. Amazing. WOW!!!!!!! this looks so cool! You find the most amazing things! 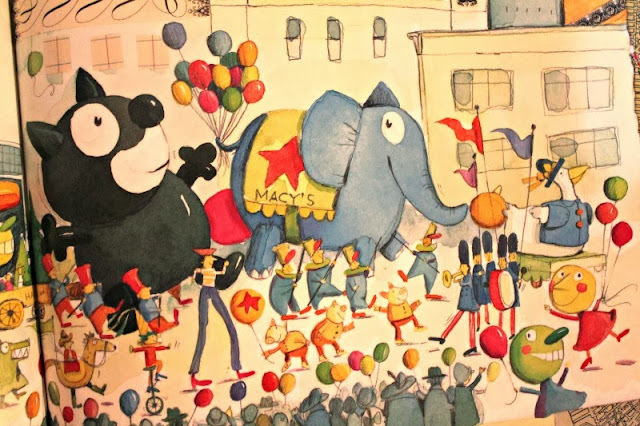 We haven't really watched the Macy's parade yet, but I think this year Julia will be totally into it! Oh, the girls' only choice in the matter is whether to find something else to do, or watch the parade with mom. Big Sis likes it more than Little Sis, shocker. They both enjoyed the book and documentary, though. As soon as Thanksgiving is over, Big Sis wants to watch Miracle on 34th Street. Wow (once more)!!! 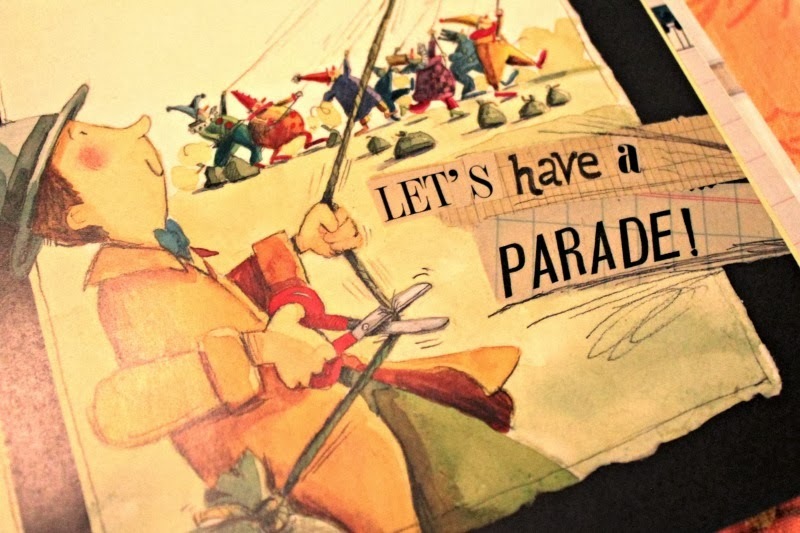 I didn't know anything about that parade. Sounds amazing. 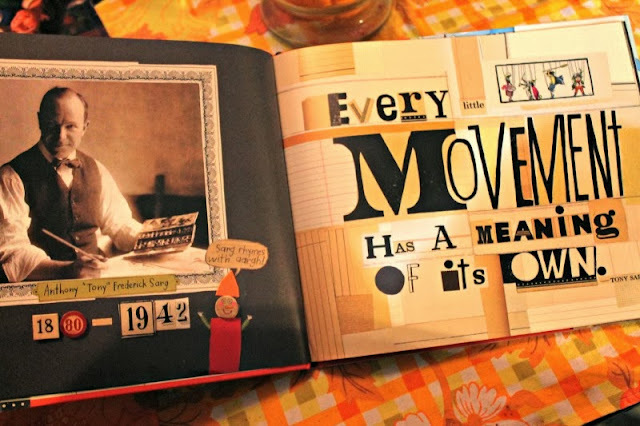 What a cool book too!!! It's the biggest parade in America, I believe. It would be so much fun to see in person someday. The book is beautiful! So Cool! I've been wanting to see more of this book ever since I saw that glimpse on insta! wow!